In the 1980s, I was not a particularly big fan of the British rock group XTC, which is not to say I disliked them, but rather that they didn't exactly get my attention all that much. Some of my friends had albums by that band and played them at parties I attended. If I thought about XTC at all back in those days, I probably put them into the same category as other English party-pop bands of the era, such as Duran Duran, A Flock of Seagulls, or the Eurythmics, not an unfair assessment when considering much of XTC's mainstream releases. I liked that style of music well enough, but in most cases, not enough to run down to the local record store to actually buy it. Back in those days, my main musical interests were classic rock from the 1970s, such as Led Zeppelin and Black Sabbath, and in particular psychedelic pop from the 1960s by groups like the Beatles, the Jimi Hendrix Experience, and Pink Floyd. I lamented the fact that the psychedelic epoch of rock music appeared to have ended many years earlier, and felt disappointed that I was living at a time when most pop musicians seemed to be trying to move away from the trippy retro influences that I myself was only beginning to discover and appreciate. Put more simply, I felt that I had been born too late. Well, unbeknownst to me, XTC apparently had similar feelings. Maybe like me, they thought that they had come on the scene about twenty years too late. Perhaps acting upon such sentiments, in 1985 they temporarily adopted the moniker Dukes of Stratosphear for a recording project they entitled 25 O'clock. It consisted of six tracks, three on each side, and was released as an EP, or mini-album. I first heard that EP that same year when visiting the apartment of a friend of mine who seemed to be romantically interested in my sister. He had just picked up the release, and swore that it was amazing and would blow our socks off. My sister wasn't all that impressed, and my friend decided to move the conversation on to other topics that might be more interesting to her. While they talked about this and that, I listened to the music, transfixed. Looking at the trippy retro art on the EP cover, which hearkens back to the design for the famous Cream album Disraeli Gears (1967), I found it hard to believe that it had just come out, but he insisted several times over that it was indeed brand new and not a reissue of any kind. He then explained that the Dukes of Stratosphear were not a real band, but instead just the members of XTC with a disguised identity. Knowing as much as I did about XTC's very contemporary-sounding music, I found it very hard to believe that they had come up with a psychedelic throwback mini-album like that one. I listened to the EP a few more times before my sister and I left his apartment, still not entirely sure if he had been pulling my leg or not. As you know, we didn't have Wikipedia back in those days to do a quick fact check on something like that. Many years went by, and during that time I never followed up on my interest in that odd little EP, but I never forgot about it either. The title track, "25 O'clock," seemed to be everything that you might want or expect out of a tripped-out, 1960s-styled song, with a spacey organ, a hypnotic bass line, a soaring, reverb-soaked guitar solo in the middle, a mesmerizing drum beat, and passionately romantic lyrics with some absurdist elements. It almost seemed that XTC were asking us: "Hey, do you miss the psychedelic heyday of the 1960s? Well, then, help yourself to a big, heaping serving of THIS!" It was kind of like you had meekly asked for a scoop of ice cream and had instead gotten handed a triple-decker hot fudge sundae. They so far surpassed my expectations that it seemed unbelievable that they were an established 1980s act using a pseudonym, and not the real deal from two decades earlier. In an odd way, the Dukes of Stratosphear are even more intensely psychedelic than the British artists from the 1960s who pioneered and embraced that particular style. As I see it, this is because they recorded 25 O'clock with the benefit of hindsight. They were able to look back in time at the entire oeuvre of 1960s-era psychedelia and synthesize, condense and intensify their favorite elements and aspects of that musical style. "If we could get in a time machine and go back to 1967 and form a band, what kind of music would we play?" Evidently, if you were a musician during that era, and were involved in the psychedelic scene, you had no way of knowing where it was all going to lead, or how long it might last. 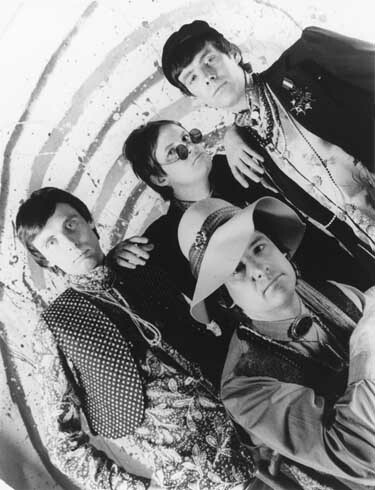 Further complicating matters, 60s-era psychedelic music can be classified into several different subgroups of styles, from lively reinterpretations of the classic vaudevillian music-hall format to extended, improvised electronic noise experimentation and instrumental free-for-alls. You had to pick your place in the spectrum between one extreme and the other, not completely certain whether you were joining in on little more that a fleeting fad, or leaving a lasting imprint upon the history of popular music. But of course, since XTC were looking back to the past, they didn't have to deal with such artistic uncertainties — they already knew which parts of the psychedelic music catalog to emphasize, and which to pass over, since the ensuing twenty years had already abundantly demonstrated what had staying power and what did not. For those reasons, 25 O'clock is clearly not a groundbreaking album in any sense, but rather an imaginative and highly whimsical revisiting of yesteryear, as well as a skillful and inspired effort to recapture the essence of a bygone musical era and to amplify its most salient attributes. That being said, if you listen carefully, you can't help but hear some of the 1980s bleeding into the tracks. XTC had access to the best recording technology available at that time, and made full use of it for their novelty EP, although in all other respects they were careful to follow typical production techniques from twenty years earlier. As a result, the songs are distinguished by the echo-laden, heavily saturated feel common to the 1960s, yet also feature a remarkable degree of clarity and fullness, undoubtedly owed to the advances in studio hardware since the psychedelic era. Also, as a band known for its tightly-controlled and generally short compositions, XTC sticks to its customary pop ethos for 25 O'clock, and limits the length of the carefully-constructed tunes to no more than six minutes each, more in keeping with common musical trends in the 1980s. Likewise, in some ways, and in spite of the band's determination to recreate the psychedelic feel, the slickness and seamlessness that characterized so much popular music during the Reagan/Thatcher era is apparent on this EP as well. To a significant extent, I suppose that XTC just couldn't help being their 1980s selves, regardless of the humorously absurd pseudonyms (Sir John Johns, The Red Curtain, Lord Cornelius Plum and E.I.E.I. Owen) that they adopted as members of the Dukes of Stratosphear. It's hard to say whether or not XTC decided to follow up their pseudo-psychedelic act with Psonic Psunspot (1987) due to the number of copies of 25 O'clock that were sold, or perhaps in spite of that number. I wasn't able to locate any definite information in that regard, so I can't say for sure. But I can affirm that 25 O'clock was by no means a blockbuster release and did not really shake up the music industry in any significant way, even though it certainly did get the attention of hipsters working at locally-owned music stores. So, with all profitable motives aside, I might venture that XTC simply had a good time recording as the Dukes of Stratosphear, and wanted to repeat the pleasurable experience. If anything, there is a marked sense of freewheeling fun on both releases, which were merged into one CD-only release called Chips from the Chocolate Fireball (originally issued in 1987, and re-released in 2009 with bonus tracks). Some months ago, I read a comment on a YouTube video for a Dukes of Stratosphear song, stating that the reviewer really liked the track in spite of his/her impression that XTC had just kind of slapped it together with a minimal amount of effort as a kind of joke or halfhearted side project. I can really understand how someone might come to that conclusion, since songs by the Dukes of Stratosphear do superficially come across as spontaneous musical sketches, but as a musician, I can tell that some serious planning and rehearsal went into their music. You can't come up with material like that off the cuff. Actually, after listening extensively to XTC's regular releases from the period, I have to wonder if they put more effort into being the Dukes of Stratosphear than into being XTC. It seems to me that it would be far more demanding for an artist to attempt to be someone else from another time period than to just act like oneself in the present. 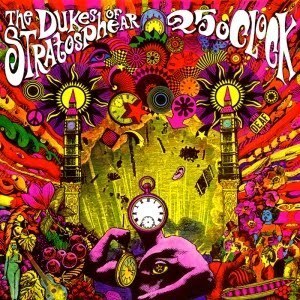 In 2007, a full twenty-two years after I had first heard 25 O'clock, I was talking with webpage Editor-in-Chief Somebody about music from the 1980s, and casually mentioned the one time I had heard the Dukes of Stratosphear. He remarked that he owned a copy of Chips from the Chocolate Fireball, and volunteered to share it with me. So, for the first time in my life, I got to sit down and listen to the entire body of work produced by this pseudo-band for a few brief years in the 1980s. During a span of several days, it was practically the only thing I listened to. Normally, I wouldn't write an in-depth article for On the Turntable based upon only two releases by one band, but I feel that an exception needs to be made in this case, since, to my knowledge, nobody attempted anything even remotely similar during the mid-1980s. Interestingly, the Dukes of Stratosphear may have marked a curious turning point for 1960s nostalgia, as well as a kind of rebooting — albeit of limited influence — of musical trends in the 1980s. As I wrote earlier, it seemed to me that throughout much of the 1980s, popular music as a whole was trying to distance itself from memories of the 1960s and 1970s. Robotic programmed drum tracks abounded, artificial-sounding synthesizer melodies were everywhere, and the lyrical impressionism of the previous two decades was supplanted by a flood of tunes oriented around mundane relationship-based themes, perhaps most befittingly epitomized by Rick Astley's "Never Gonna Give You Up" from 1987, now infamous as the "rick-roll" of YouTube. I feel like I should be fair to Rick Astley here and admit that "Never Gonna Give You Up" is a pretty good tune. You have to respect Astley for his unapologetic trumpeting of hokey moral values in a highly danceable pop song. Back in the day, a lot of fluffy mid-1980s pop was rather unfairly condemned as disposable and forgettable, but nearly thirty years later, we're still listening to a lot of it, so maybe it wasn't all that bad after all. In fact, the argument might be made that the backlash against sentimental, mainstream 1980s party-pop was too severe, and that the genre was all too ruthlessly squelched in order to make way for the emergent, self-consciously "mega-cool" alternative-rock movement at the end of the decade, which fully blossomed in the early 1990s, and was represented by angst-drenched songs such as "Smells Like Teen Spirit" performed by the jaded and cynical flannel-shirt‑wearing grunge band Nirvana. 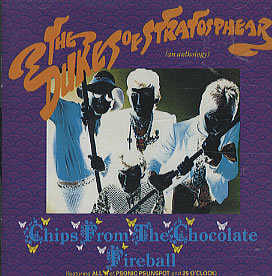 As I've already mentioned, in the mid-1980s, the appearance of Chips from the Chocolate Fireball was not destined to have much of an immediate impact, but during the ensuing years, other bands and artists picked up on the retro vibe and added their own take on it. British bands the La's and Blur, and the American band Lemonheads followed up on the 1960s-based feel, generally steering away from the overt psychedelia of the Dukes of Stratosphear, and emphasizing more the complex guitar chord chemistry and intricately harmonizing vocal melodies of yesteryear. Other bands, such as British group Verve, attempted to take things even further down the psychedelic road by practically reinventing the genre, so that it became even more ambient-driven and impressionistic than before, and no longer seemed so indebted to 1960s influences. Clearly, all of these later developments owed something to Chips from the Chocolate Fireball. It was like XTC were the first ones to jump into the pool, so to speak. Once the La's, Blur, Lemonheads and Verve — and slightly later on, Oasis — saw that the water was fine, they jumped in also. Psychedelic music was finally recognized as more than just a bygone musical trend, and the genre was re-explored, reinvented, and redeveloped. As if to prove the point that psychedelia was alive and well, the 1960s-based film Austin Powers — featuring a shamelessly and stereotypically retro soundtrack — came out in 1997, and became a surprise smash hit. Today, the psychedelic vibe is just one of many viable stylistic options in the musical palette of today's popular artists. For better or worse, we probably have the Dukes of Stratosphear to thank for getting the ball rolling. But let's take a look at Chips from the Chocolate Fireball itself, in its own right. For the psychedelia enthusiast like myself, it's a fairly solid release from start to finish. It's one of the few albums of such an extensive length that I enjoy listening to from end to end without skipping any songs. As I've already written, this is a kind of 1960s-style tour de force, featuring all the usual goodies in the epic song of that era. It kind of makes me think of what the Doors' "Light My Fire" might have sounded like if Pink Floyd had performed it with a different melody and lyrics. "Bike Ride to the Moon"
This captures quite well the fanciful, childlike inventiveness of Syd Barrett in some of the earlier Pink Floyd compositions, but with a considerably more lighthearted feel. This song has a gong in it. How groovy is that? It really is a funny tune, and the sexual double-entendres in the lyrics, reinforced by the exaggeratedly randy musicianship, are so completely over the top as to be practically ridiculous. At the end of the track, we hear a nasally New-York-accented man speaking over the phone, condemning the track: "That is the most obscene abomination of a song that I, I, I — that is trash, that is dirt, that is filth, what possessed you to write such a disgusting, degeneratized song as that? And I'm complimenting you by considering it a song." All good fun, of course, and the Woody-Allen-sounding prude at the end makes it all the more so. "The Mole in the Ministry"
This song has a somewhat similar feel to the Beatles' "I Am the Walrus," but the semblance is only superficial at best. It's a kind of melancholy song, yet strangely catchy, and somehow perversely upbeat in spite of the vaguely disturbing lyrics and sleepy Moog synthesizer. 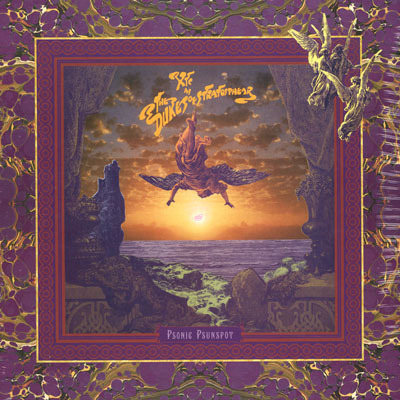 The intro to this song, beginning with the sounds of a lighthouse horn blasting through the coastal fog, features a hanging bass note and steadily building instrumentation, just like so many classic psychedelic tunes from the 1960s. And perhaps more than any other track on the album, the bass guitar is the featured instrument. The powerful main bass riff, or hook, cleverly coordinated with a fierce, heavily accentuated drumbeat, is one of the best I've ever heard on a psychedelic tune. It's all pure, indulgently trippy pop pleasure delivered with a truckload of attitude. "You're a Good Man Albert Brown"
This sounds almost like something that Paul McCartney might have come up with sometime between 1967 and 1969. It features a heavy dose of granny music, hearkening back to the old pub-piano style of the WWII era, and the lyrics call to mind the sardonic Pink Floyd track "Corporal Clegg" from the Syd Barrett days. Albert Brown went to war and was wounded, shot some people down but is still a good man, married that nurse named Alice, and then had a bunch of kids. It's all presented as a jocular, slobbering, beer-soaked celebration among working-class pals, but the cheerfulness seems rather strained, as if in reality Albert Brown's life has been one long, dreary, colossal pain in the arse, and he probably just can't wait for the unwelcome tribute to end so that he can go home and go to bed. The Byrds are marvelously honored on this track by the excellent use of a 12-string electric guitar and the brilliant employment of a dreamy flanging effect on the mix. La-la-la-ing vocals, hypnotic bass guitar, triptastic drumbeat, a scritching comb, jet engine noises — what else can I say? Who needs to take acid? Just put on your headphones and give this tune a good listen. In and of itself, that should be enough to make you hear colors and see sounds. The track begins with a simple strummed acoustic guitar and solitary voice, describing a man who used to be single, who back in the day spent most of his time hanging out at pubs and knocking back pints with his buddies. The style of the music suddenly changes, taking on a decidedly more orchestrated, feminine feel, and the voice sings, "Then came her" with a bit of cheesy horn section thrown in, evidently in tribute to the girl who came in to his life and headed him off in a completely different direction. The singer gleefully proclaims that the guys at the pub "hated her." The music goes back to the guitar and voice, and we are back at the pub, where his former buddies have left his old chair open for him "if he wants it," assuming that he might one day get away from the "mortgage round his neck" and "eight screaming kids." It's kind of funny, yet there does seem to be a slightly serious overtone at the same time. As I've already noted, this music is not cutting-edge or innovative in the least, but again, that's not the point. In my view, not all good music is about pioneering new styles, and the Dukes of Stratosphear are one very good case in point in that regard. So, if you want to explore the resurgence of psychedelic styles in music since the 1980s, and enjoy a bit of easygoing fun, Chips from the Chocolate Fireball would be the place to start.